While I believe that a global peak in worldwide oil production presents an unprecedented challenge to the way most of the Western world lives our lives, I do not believe that world oil production has yet peaked. However, in looking at the new oil capacity that is scheduled to come online, and contrasting that with the projected demand growth, it became clear to me over a year ago that demand was going to rise faster than new supply could come online. This prompted me to propose the idea of “Peak Lite.” It is “peak”, because the symptoms will mostly manifest themselves as those of a true production peak: Not enough supply to meet demand. In fact, we have already passed the point at which there is enough $25/bbl oil supply to meet everyone’s desires. But production can still grow in this scenario, which is why it is “lite”. In that case, people may underestimate the significance of the problem. 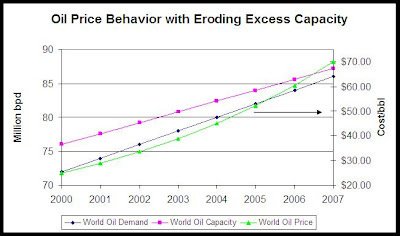 If excess capacity had not been eroded in the past 5 years, I believe the oil price would have remained around $25/bbl as shown in Figure 1. This figure is based upon the presumption that a constant 4 million bpd excess capacity existed from 2002-2007. That is enough excess capacity that even a fairly large disruption in supply can be managed by bringing excess capacity online. Figure 2 shows a more realistic picture of the behavior of the oil market over the past 5 years. As excess capacity has eroded, the price has risen and volatility (no volatility effects are simulated) has increased because any disruptions (or perceived disruptions) may be difficult to manage. If current trends continue, Figure 3 may provide an indication of things to come, although I do expect the price rise to be incredibly volatile. I also think we will see periods of stability as demand is destroyed, but once the wealthier countries are the ones left bidding on the remaining oil, the price will likely increase dramatically. Figure 3. Future Oil Price Behavior? 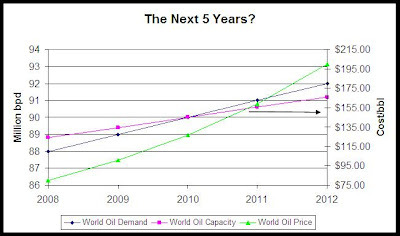 Figure 3 shows demand exceeding supply in less than 5 years, although the exact timing is uncertain. And while some will argue that in economic terms demand can’t exceed supply, in real terms it can. If a man starves to death because he can’t afford food, does this mean that he did not demand food? No, he did demand food, but perhaps could not afford the supply at the market price. Many will find themselves in this position as prices increase, although demand for oil is admittedly more elastic than demand for food. Despite four years of high oil prices, this report sees increasing market tightness beyond 2010, with OPEC spare capacity declining to minimal levels by 2012. 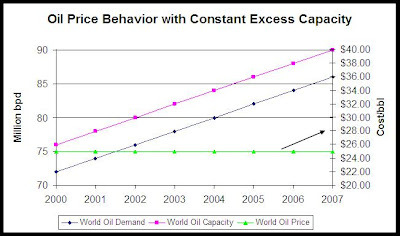 A stronger demand outlook, together with project slippage and geopolitical problems has led to downward revisions of OPEC spare capacity by 2 mb/d in 2009. Despite an increase in biofuels production and a bunching of supply projects over the next few years, OPEC spare capacity is expected to remain relatively constrained before 2009 when slowing upstream capacity growth and accelerating non-OECD demand once more pull it down to uncomfortably low levels. It is possible that the supply crunch could be deferred – but not by much. The demand side of this analysis is based on country-level GDP growth forecasts from the OECD and IMF, which amount to a global average of around 4.5% annually. Lowering GDP growth to around 3.2% per year from 2008-2012 reduces annual oil demand growth from 2.2% to around 1.7% and the call on OPEC crude drops by around 2 mb/d by 2012. But this merely postpones by a year the point at which oil demand growth surpasses the growth in global oil capacity – in effect, delaying the return of minimal spare capacity by only a few years (unless the trend in upstream capacity growth changes). But the oil market cannot be looked at in isolation. Not only does oil look extremely tight in five years time, but this coincides with the prospects of even tighter natural gas markets at the turn of the decade. Over the past 25 years there has been substitution away from fuel oil and towards natural gas. However, when natural gas supplies have been insufficient or there have been supply problems (such as those seen following Hurricanes Katrina and Rita in 2005, Russia in 2006), fuel oil has been the natural substitute. By the end of the decade, such flexibility may be constrained, producing upward pressures on all hydrocarbons. The IEA suggests that current OPEC spare capacity is 2.50 million barrels per day, but this will dwindle by 1 million barrels per day by 2012. I believe the erosion of spare capacity we have seen since 2002, when oil was around $25/bbl, is primarily responsible for the price increase to the $70/bbl range. With several million barrels of spare capacity, there are many different producers that can bring capacity online in the event of a disruption. As that capacity erodes, there are fewer options for bringing on supplies if they are needed. The price creeps up, and volatility increases. Whereas OPEC may not have been able to control prices in 2002 because there were too many suppliers to compensate for throttled production, in 2007 it is clear that other suppliers can no longer compensate for idled OPEC capacity. OPEC members have seen that as long as they maintain solidarity, they can maintain a floor price for crude oil (maintaining a ceiling is a different matter, as volatility in a tight market can push up prices much faster than they can react). In the event of a worldwide peak in oil production, there won’t be enough oil to go around. Poorer countries will find themselves priced out of the market at various price points. The situation will be the same for Peak Lite, and this is what we have observed in the past 2-3 years. Many developed countries have seen their oil consumption rise over the past 2 years, even though world oil production growth has been flat to slightly negative. This means that demand destruction is occurring in some locations. I expect this trend to continue. At the point that developed countries are bidding against each other for remaining supplies, the price of crude is likely to go much higher. Until now, demand has been moderated as poor countries in Africa and Asia are increasingly unable to afford $70/bbl oil. This price point is unlikely to significantly alter the demands of the United States, Europe, or Japan, which means that at some point of capacity erosion we could see oil prices quickly shoot past $100/bbl. While I think I will win my $1,000 bet on oil prices this year, I am not confident that the price won’t reach $100/bbl within 2 years. To the extent that OPEC actually does have spare capacity, I expect them to continue to test the limits of what the world can withstand as far as oil prices go. If I managed their oil reserves, my goal would be to extract the highest possible price for the oil, but not so high as to trigger a global recession which would destroy demand and collapse the price. OPEC has gradually increased the price that they are satisfied with as they have seen that demand has remained strong at $50, $60, and finally $70/bbl oil. I expect them to continue to push this limit. By 2009, they may be suggesting $90/bbl as the price they are comfortable with. The bottom line is that I believe the world has now reached the point at which the symptoms of peak oil are starting to manifest themselves – even though I still do not believe we have reached a true production peak. But, the consequences will be much the same as if we had. hi robert – presumably national governments know all this/carefully stage-manage the whole thing – when peak is reached, does it mean a terminal decline-terminal recession ? as there is no replacement – even with asias expansion. A bit of a worry isn’t it ? won’t there be an inevitable plateau in the economic activity in the world – ? Sorry for the late response; I had missed this. I think some countries can continue to grow, but those that are heavily dependent on oil won’t. Whether the global economy as a whole can grow under that scenario is doubtful as far as I am concerned. I’d like to see some discussion of the extent to which this peak may be natural and unavoidable, rather than the deliberate result of agendas which seek to destroy capitalism and/or technological society by placing as much of the remaining supply as possible — especially that in Western countries — permanently off-limits and making up un-called-for “environmental concerns” as a way to marginalize objections to those policies. This is not some crackpot conspiracy theory — it comes directly from the openly published agendas of environmental groups and the UN, of which those quoted here are typical.